Dry air contains by volume 78.08 % of nitrogen, 20.95 % of oxygen, and 0.93 % of argon along with traces of a number of other gases. Ambient air may contain varying amount of water vapor (depending upon humidity) and other gases produced by natural processes and human activities. Air separation plants are used for the production of nitrogen or/and oxygen as gases and sometimes as liquid products. Some plants also produce argon. All air separation plants employ either non cryogenic based technologies or cryogenic based technologies. Non cryogenic air separation plants produce gaseous nitrogen or oxygen products using near ambient temperature separation processes. These plant produce oxygen which is typically 90 % to 95.5 pure or nitrogen which is typically 95 5 to 99.5 % oxygen free. Cryogenic air separation plants are most commonly used to produce high purity products at medium to high production rates. They can produce products as gases or liquids. This technology is based on difference in boiling points of gases. All air separation processes start with compression of air. The cost of electric energy is the largest single operating cost incurred in air separation plants. It is usually in the range of one third or two thirds of the operating costs associated with producing gas and liquid products. Cryogenic plants are based on cryogenic air separation processes. The basic process was commercialized early in the 20th century. Since then, a large number of process configuration variations have emerged, driven by the desire to produce particular gas products and product mixes as efficiently as possible at various required levels of purity and pressure. These air separation process cycles have evolved in parallel with advances in compression machinery, heat exchangers, distillation technology and gas expander technology. The complexity of the cryogenic air separation process, the physical sizes of equipment, and the energy required to operate the process vary with the number of gaseous and liquid products, required product purities, and required delivery pressures. Plants with production of only nitrogen gas are less complex and require less power to operate than plants with production of only oxygen gas. Co-production of both gases increases capital cost and energy efficiency. Making these gases in liquid form requires additional equipment and more than doubles the amount of power required per unit of delivered gas. Argon production is economical only as a co-product with oxygen. Producing it at high purity adds to the physical size and complexity of the air separation plant. 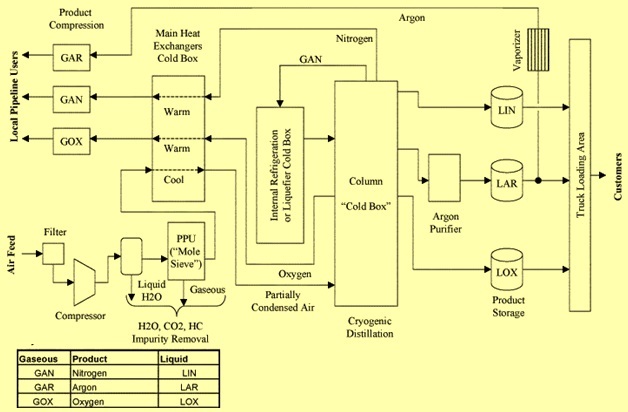 Typical flow of cryogenic air separation process is shown in Fig 2. The first step is filtering, compressing and cooling of the incoming air. In most of the cases air is compressed between 5 Kg/Sq cm and 8 Kg/Sq cm depending on the product mix and the required product pressures. In this step the compressed air is cooled and majority of the water vapour in the incoming air is condensed and removed as the air passes through a series of inter stage coolers plus an after cooler following the final stage of compression. The second step consists of removal of impurities, in particular, but not limited to, residual water vapour plus carbon dioxide. These components are removed to meet the product quality specifications and prior to air entering the distillation portion of the plant. There are two basic approaches for removal of water vapour and CO2. They are (i) molecular sieve units (ii) reversing exchangers. Most of the new air separation plants employ a molecular sieve pre purification unit to remove carbon dioxide and water from the incoming air. Reversing exchangers for removal of water and CO2 are more cost effective for smaller plants. In plants utilizing reversing heat exchangers, the cool down of the compressed air feed is done in two sets of brazed aluminum heat exchangers. When reversing heat exchangers are used, cold absorption units are installed to remove any hydrocarbons. The third step is additional heat transfer against product and waste gas streams to bring the air streams to bring the air feed to cryogenic temperature (- 185 deg C). This cooling is done in brazed aluminum heat exchangers which allow the exchange of heat between the incoming air feed and cold product and waste gas streams exiting the separation process. The exiting gas streams are warmed to close to ambient air temperature. Recovering refrigeration from the gaseous product streams and waste stream minimizes the amount of refrigeration that must be produced by the plant. The very cold temperatures needed for cryogenic distillation are created by a refrigeration process that includes expansion of one or more elevated pressure process streams. The fourth step is the distillation process which separates the air into the desired products. To make oxygen, the distillation system uses two distillation columns in series, which are commonly called the high and low pressure columns. Nitrogen plants may have only one column, although many have two. Nitrogen leaves the top of each distillation column while oxygen leaves from the bottom. Impure oxygen produced in the initial (higher pressure) column is further purified in the second, lower pressure column. Argon has a boiling point similar to that of oxygen and will preferentially stay with the oxygen. If high pure oxygen is needed then argon need removal. Argon removal takes place at a point in the low pressure column where the concentration of argon is its highest level. The argon, which is removed, is usually processed in an additional ‘draw’ crude argon distillation column that is integrated with the low pressure column. Crude argon may be vented, further processed on site, or collected as liquid and sent to plant having argon refining facilities. Cold gaseous products and waste streams that emerge from the air separation columns are routed back through the front end heat exchangers. As they are warmed to near-ambient temperature, they chill the incoming air. The heat exchange between feed and product streams minimizes the net refrigeration load on the plant and hence the energy consumption. Refrigeration is produced at cryogenic temperature levels to compensate for heat leak into the cold equipment and for imperfect heat exchange between incoming and outgoing gaseous streams. In the refrigeration cycle of air separation plants, one or more elevated pressure streams (which may be nitrogen, waste gas, feed gas, or product gas, depending upon the type of plant) are reduced in pressure, which chills the stream. To maximize chilling and plant energy efficiency, the pressure reduction (or expansion) takes place inside an expander (a form of turbine). Removing energy from the gas stream reduces its temperature more than would be the case with simple expansion across a valve. The energy produced by the expander is put to use to drive a process compressor, an electrical generator or any other energy-consuming device. Gaseous products typically exit the cold box (the insulated vessel containing the distillation columns and other equipment operating at very low temperatures) at relatively low pressures, often just over one atmosphere (absolute). In general, the lower the delivery pressure, the higher the efficiency of the separation and purification process. The product gas is then compressed in compressors to the pressure needed by the product gas for its use. Portions of the cryogenic air separation process that operate at very low temperatures (for example distillation columns, heat exchangers and cold interconnecting piping) must be well insulated. These items are located inside sealed (and nitrogen purged) ‘cold boxes’ which are relatively tall structures that may be either rectangular or round in cross section. Cold boxes are packed with rock wool to provide insulation and minimize convection currents. Depending on plant type and capacity, cold boxes may measure 2 to 4 meters on a side and have a height of 15 to 60 meters. Pure argon is typically produced from crude argon by a multi-step process. The traditional approach is removal of the two to three percent oxygen present in the crude argon in a ‘de-oxo’ unit. These small units chemically combine the oxygen with hydrogen in a catalyst containing vessel. The resultant water is easily removed (after cooling) in a molecular sieve drier. The oxygen free argon stream is then processed in a ‘pure argon’ distillation column to remove residual nitrogen and unreacted hydrogen. Advances in packed-column distillation technology have created a second argon production option, totally cryogenic argon recovery that uses a very tall (but small diameter) distillation column to make the difficult argon/ oxygen separation. The amount of argon that can be produced by a plant is limited by the amount of oxygen processed in the distillation system; plus a number of other variables that affect the recovery percentage. These include the amount of oxygen produced as liquid and the steadiness of plant operating conditions. Due to the naturally occurring ratio of gases in air, argon production cannot exceed 4.4 % of the oxygen feed rate (by volume) or 5.5 % by weight. When liquid products are usually produced in a cryogenic air separation plant then a supplemental refrigeration unit is added to (or integrated into) the basic air separation plant. This unit is called liquefier and use nitrogen as the primary working fluid. Liquefier capacity may range from a small fraction of the air separation plant capacity up to the plant’s maximum production capacity for oxygen plus nitrogen and argon. The basic process cycle used in liquefiers has been unchanged for decades. A typical liquefier takes in near ambient temperature and pressure nitrogen, compresses it, cools it and then expands the high pressure stream to produce refrigeration. The basic difference between newer and older liquefiers is that the maximum operating pressure rating of cryogenic heat exchangers has increased as cryogenic heat exchanger manufacturing technology has improved. A typical new liquefier can be more energy efficient than one built thirty years ago if it employs higher peak cycle pressures and higher efficiency expanders. Oxyplants India deals mainly with Oxygen plants, Nitrogen plants. We are renowned as the Manufacturer of Oxygen Plants, Nitrogen Plants and Acetylene plants. Sir, very lucid and easy to understand.